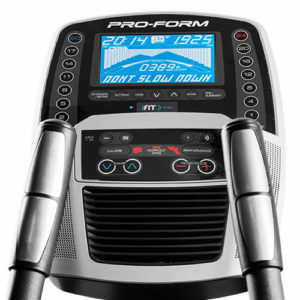 ProForm PRO 9.9 Elliptical Review | Read our Expert Review! 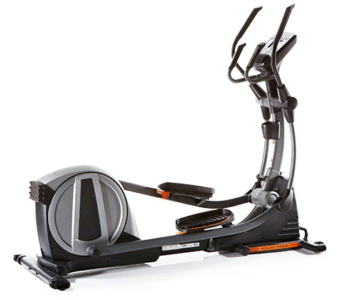 The ProForm PRO 9.9 Elliptical Trainer is ON SALE! Loaded with Features at a Value Price! 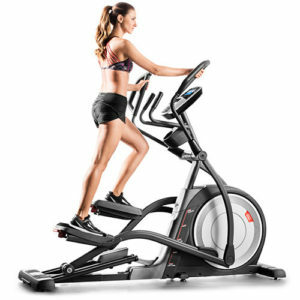 The ProForm Pro 9.9 elliptical trainer has some innovative and appealing features, and typically sells at a very reasonable price. It is that combination which makes ProForm elliptical trainers so popular. This is a front drive crosstrainer, in comparison to a rear drive model. There are pluses and minuses to each. The advantages of the front drive are a more compact design, closer pedals for less hip strain, and it is easier to mount/dismount. Read a comparison of front and rear drive ellipticals here. MID-WEEK SALE ENDS THURSDAY: The ProForm PRO 9.9 is ON SALE for $1599 with Free Shipping! Financing is Available. Also, check out the SMART ProForm Pro 12.9 for a better price and value. Power Incline — The ability to adjust the incline is one of the most attractive features of the Pro 9.9. There are a couple of benefit to being able to adjust the incline. Like walking up a hill, when you exercise at a steeper incline you are going to get a more intense cardio workout. And like walking up or down a hill, when you raise or lower the incline you will target different parts of your lower muscles like glutes, quads and claves. 21″ Power Adjustable Stride Length — You can adjust the stride length on the Pro 9.9. This allows you or any other users in your family to find the length that best fits your comfort zone. iFit Live Coach Ready—The Pro 9.9 is iFit Coach Ready. This means you can access the iFit Live fitness tracking programs with just a wireless Internet and a connected smart device. Plus, this machine will work with iFit Live to help you trace real life routes using Google Maps. Then, while you’re working out, your machine will simulate the actual terrain by adjusting your resistance levels. iFit Live will also let you create customized workout plans. Your online account will let you set fitness goals, record workouts, and track your progress. The program even has audio coaching to help you along the way. Research has shown that people who track their progress achieve better results. 28 Lbs. Flywheel — The 9.9 NE has an above average weighted flywheel for a $999 elliptical. The extra weight contributes to a smooth and natural motion. 350 Lbs. Weight limit — They put the weight limit at 350 lbs., which we believe is absurd. We do not believe that the machine is heavy enough for that type of user. We would put it at around 275 lbs. Heart Monitoring – EKG Grip Pulse heart rate monitoring along with an included Wireless Chest Strap. ProForm Pro 12.9 – This may be a better option with its 7″ Touchscreen and tablet holder – Read our full review here. No Tablet Holder —This is a significant difference between the ProForm Pro 9.9 and the other ProForm Pro models. You may miss having a place to rest your tablet while you workout. For comparison, the ProForm Pro 12.9 has both an 7″ Smart Full Color Touchscreen and a tablet holder, so it allows you to make better use of the iFit Live features. Built-in Speakers and iPod Ports — Music is a great motivator and with the ProForm 9.9 NE you have speakers built into the console and the ability to plug in your iPod player. Fan in Console — A cooling fan built into the console blows a refreshing breeze onto your upper body to keep you more comfortable during workouts. Controls in the Handlebars — We like this feature. You have the ability to make changes to the resistance or the incline on the moving handlebar grips. You do not have to break your stride and make changes on the console. Adjustable Foot Pedals — You are able to adjust the angle of the foot pedals so you can minimize foot lift, which reduces stress and strain to your feet. 32 Workout Programs — If you don’t want to spend the money on iFit Live, the 9.9 comes with 32 different workout programs that provides a variety of challenges. Warranty — You get a 3-year parts and 1-year labor warranty, which is a typical warranty for a machine in the $999 price range. The numerous features found the the ProForm 9.9 NE make it an overall attractive package. And the price is very appealing. When priced at $999 this machine deserves serious consideration. NordicTrack Space Saver SE7i – You may also want to consider a rear drive elliptical from NordicTrack – Read our full review here. We also would consider the rear drive NordicTrack SpaceSaver SE7i. NordicTrack leases the patent for the design from Precor, which builds commercial grade elliptical trainers. We recommend you read our NordicTrack SpaceSaver SE7i review before you make a decision. You may also want to check out the ProForm Pro 12.9 with a tablet holder and 7″ Smart Full Color Touchscreen. Depending on the current pricing, this may be a better deal. 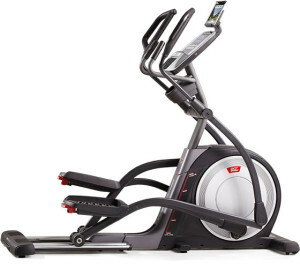 Never owning an elliptical, I wanted to purchase something that would fit me, and hopefully last. This machine was easy to setup, (just make sure you have the headroom) and quick to start using. I would highly recommend purchasing this item to others that want a stable piece of equipment and a great work out. The fan on this is outstanding. Having a place for my iPad to listen to audio books to workout is perfect!